The visit to Porto Cristo is only included in the full day option. Clients coming on a cruise: full day tour is from 8:45-17:45 and it is your responsability to check the timing fits on your stop in the Port. Depart from your Mallorca hotel in a comfortable, air-conditioned minivan and relax during the scenic journey inland through picturesque hamlets. Next, descend to the atmospheric depths of the Cavern of the Dragon with your accomplished guide. 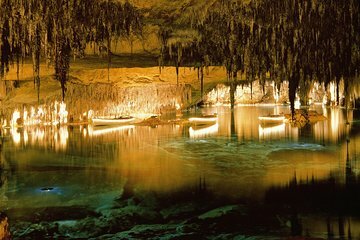 Stroll through the stalactite-studded passages of the cavern and gain insight into the natural wonders’ fascinating history; discovered in the 14th century, the colossal caves stretch for more than 1.5 miles (2.4 km). During your stint beneath ground, enjoy a moving 10-minute classical music performance. Gaze at a spectacular light show that bathes Lake Martel (the world’s largest underground lake) in luminous color then climb aboard a boat for a panoramic tour of the water. If you wish, continue to explore the Cavern of the Dragon on foot and meet your group at a pre-arranged spot. Emerge into the Spanish sunshine and venture to Porto Cristo to absorb the charm of this quaint fishing village. See the town’s most significant sights on an informative guided tour the explore the enclave independently during some relaxed free time; see the 15th century watchtower or relax in a prime selection of rustic restaurants and ambient cafes. Return to your original departure point in your comfortable transportation. Please see the Itinerary section below for information on the pickup locations in each area.